Travel is more than just sightseeing. Do you want to go to a new country for a reason, travel long term and in an alternative way? A meaningful and fun option to make it possible is to teach languages abroad. 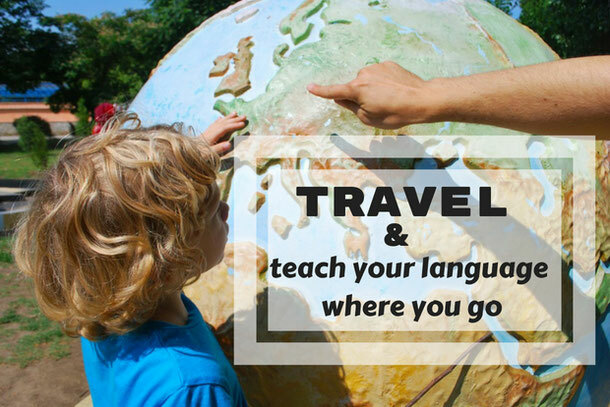 In this long and comprehensive blog post you will find out how to combine your passion for languages and intercultural communication with traveling. If you are a fluent speaker of English, French, German, Russian, Spanish, Chinese, or Japanese, there are many opportunities for you to experience new countries and cultures while earning a living and saving money. English is the language in highest demand, but the other languages listed above are also in high demand. The opportunities fall into two basic categories: teaching at private training schools, or teaching in a countries education system, which includes the primary, secondary, and college levels. At private training schools, many adults seek language education for business reasons, to facilitate traveling, for personal enrichment, or a combination of these reasons. Many students who study a language through their countries education system seek to supplement that through the smaller classes with the native speakers that are available at private training schools. In many countries where English is not the mother tongue, English is often a required part of the curriculum, and sometimes as early as the kindergarten level. At universities, and even many high schools, foreign languages other than English are offered. Fluent speakers of English and other languages are highly sought after to lead fun activity centered classes where learners can hone their conversational skills. If you are a complete novice at teaching a foreign language, not to worry! There more training courses, inexpensive books, and free online lesson ideas available then you will ever need to use. When you teach a language in a foreign country, you become more than just a traveler. You have colleagues who will provide you with assistance and give you inside information about your location that would otherwise be unavailable. By experiencing the working environment, you get insights into a country’s culture that are not possible through other forms of travel. Teaching Languages Abroad is FUN! You will find that students and employers will expect your classes to be more enjoyable than, for example, math class. A relaxed and laid-back atmosphere will foster a more conversational environment, which is what you want. This is good news. If a class is going to be fun, then the teacher should be having fun, and the fun you have teaching will be infectious. Everyone has their own style in this regard. I used to study David Letterman and emulate his style of mixing funny jokes with more serious conversation. And I never missed a chance to get a laugh out of my students. A teaching position can provide you with the financial means and the visa to stay long-term. There are some countries, like Vietnam, where it’s relatively easy to get short-term teaching contracts and visas, which can all be easily renewed, but one-year contracts are the norm. But you might want to avoid staying in some countries for a year. One approach is to stay in those countries where it’s easier to save money for longer periods of time and use the money you’re able to save for traveling through the less expensive countries for shorter periods of time. There are many places, like China for example, where your daily cost of living will be very low, but that offer teaching salaries that will allow you to save more than $1000 every month, all while enjoying a new country, a new culture, seeing local sites, and taking short trips on weekends and vacations. If you have a teaching position within a countries school system, like at a university, for example, you will often get long vacations between semesters. These vacations are often paid and can be used to visit other areas in or out of the country where you are employed. Number one is important; in some countries, it’s a legal requirement, and you might have to pay for some sort of diploma verification process. There several types of foreign language teaching certificates that you can get. The CELTA (Certificate in English Language Teaching to Adults). In some countries having one of these certificates is becoming a legal requirement. If you opt for the TESOL or TEFL it should be at minimum a 120-hour certificate. All of these certifications focus on teaching English, but even if you want to teach a language other than English, you should still have one. Almost all of what you will learn is transferable to teaching another language. There are two ways to earn your certificate, you can take an online course or an in-house course. An online course is much less expensive and is flexible in terms of when and where you study. A certificate from an in-house course is more credible and respectable. If you already have teaching experience, then an online course is alright, but if not I recommend taking the time and spending the money to do an in-house course. In addition to providing a more respected credential, an in-house course will give you practical classroom experience and feedback on your performance. At that moment your bright-shining face enters the classroom for the first time on your first job, you’ll be much more confident and relaxed. One other thing you should get before you leave your home country is a criminal background check. A lot of countries are making this mandatory for employment as a teacher, and it’s much easier to get in your home country. Also remember that some countries, like Korea, require a criminal background check not older than six months, so even if you already have one, you might need another after arrival. In my first few years of teaching, I was very serious. My classes consisted mostly of things like grammar drills, my students were bored and didn’t really pay attention. I tried adding games to my classes. A game every once in a while is a good thing. Games can break up the monotony. Games are especially effective if they serve as a review and reinforce material you’ve already taught. But, in my experience, they tend to not support extensive language use, so I would say don’t play games in too many classes. Your job title is “teacher,” but I came to think of myself more as a coach. Most of the students you teach will have already learned grammar and vocabulary in their mother tongue with a teacher form their own country. Get students using the target language at a level that’s comfortable and give feedback. If grammar points come up when giving feedback touch on them briefly. The formula I have found to be most effective is communicative and authentic tasks and activities. This word “authentic” is a bit of trade jargon. It means that the students are talking about something they would talk about if they weren’t in a language class. I’ve asked students to write down their own suggestions for lesson topics. But be careful about this one, some schools have a curriculum they want you to adhere to. “Communicative tasks and activities” means students use the target language to do something. Students get in pairs or small groups and do something together that requires using the target language. While students are busy in their groups, walk around the class checking on progress and offering help. When finished they will often present the results of their interaction to the class. Another type of activity is sometimes called “mix and mingle.” In these activities, students get up, walk around, and exchange information. For example, students plan some leisure activities and invite each other to what they are doing. If a student is free, they accept the invitation, and if not the student says what they’re already doing on that day and at that time. They continue mixing and mingling till everyone’s schedule for one week is filled up. There are many ways to get started. Based on years of experience and conversations with other teachers, here is what I recommend. Go to Thailand and take an in-house TEFL or TESOL course. They usually last for four weeks and cost about $1500 U.S. Then, when you finish your course, spend a year teaching in Thailand. Why Thailand? First of all, Thailand is a great travel destination. It has a wonderful tropical climate, lots of cheap delicious food, the Thai people are laid-back and friendly, and it’s a very foreigner friendly country. There’s also a lot of teaching courses to choose from, and their usually pretty good. Because the work environment is as equally laid back, it’s a relatively stress-free place to spend your first year teaching. Most of the in-house teaching courses offer free job placement, so you’re almost be guaranteed a job. Also, you’ll have the advantage of checking job offers more thoroughly then you would be able to if you were applying from your home country. The salary for foreign language teachers in Thailand is relatively low, but once you have your certificate and a year of experience, you’ll be ready to tackle the high-paying and more competitive job markets in other countries. But it’s possible that once you spend a year in Thailand you won’t be in too big a hurry to leave! Alexander King graduated From the University of Texas at Austin in 2005 with a bachelor's degree in International Studies, Focus on Asia. His primary focuses were Chinese language, history, literature, and philosophy. He lived in China and taught English from 2006 – 2018, and spent his summers taking motorcycle treks in and around Sichuan. His career as a writer began with writing short articles on a wide variety of subjects to serve as discussion material for English classes. He is now based in Chiang Mai, Thailand.